I need some voice actors for some characters. Message me if you would like to add an OC. I also need an editor if you or someone you know is one message me examples of your/they're work. *snoring* wait you were talking..? Since when were YOU the one in control??! Yo! Did you see that!! Undyne just touched my face!!! I'm never washing my face again!! Error.. What are you doing this time? ((Ink what are you doing)) ... ((Ink?)) Hmm, oh hi! I'm drawing wanna see? WHAT THE HELL!! GET OFF OF ME!! Look I tried to draw a drawing of you!! Can I have some spagetthi, Papyrus? Hahahah... Hi boss... Did I catch a human yet..? 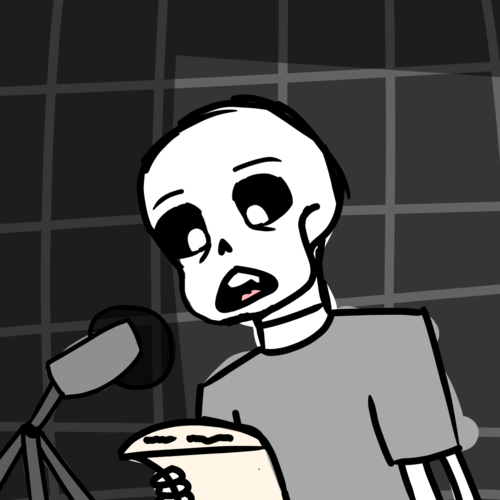 Uhh... No..
Did you catch a human yet, Sans? NO?! YOU TOOK ANOTHER NAP DIDNT YOU??!!! YOU LAZY FRIK!! Do you want some pie child? COME HERE YA LIL' PUNK!! Want to watch some anime? Oh! I didn't think you would be here so early!